Your blood sugar, adrenals and thyroid are intimately connected and potentially create quite a bit of pain and suffering when they are not balanced. So the question is, what does it feel like when your blood sugar, adrenal and thyroid balance is off? Well, do you recognize any of these? If you recognize these with any consistency, you could be living with blood sugar, adrenal, thyroid imbalance. This could be due to hypo or hyperglycemic issues. Looking at blood sugar very simply, our bodies have evolved to regulate this during times of famine when blood sugar drops and sweets were scarce. This is typically not an issue in these times and honestly, sweets are anything but scarce. An over indulgence in carbs such as white rice, fruit, soda or your favorite latte can and does often lead to a spike in blood sugar, which in turn leads to a release of insulin to normalize your glucose levels. When this mechanism occurs often, which is generally the case, the pancreas overproduces insulin, which in turn can drop blood sugar too low, with the end result of exciting the "fight or flee" response. This response will then lead to a production of cortisol, which in the end can create difficulties for digestion, immunity, overall hormone balance and of course, the thyroid. Understand that if you body is in a "fight or flee" thyroid balance is no longer important. Your body will almost always pick the "fight or flee" over general health and balance. I trust that you can see where this creates some issues. 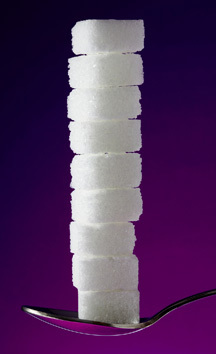 When this cycle continues over time, the body can lose its ability to keep blood sugar stable. When blood sugar is not stable this effects adrenal function which ends up being a core challenge for so many other health issues. The challenges that this causes with the gut, brain, immune system and chronic inflammation often sets individuals up for autoimmunity, which often effects thyroid function. Here's a catch 22 on this though. Low thyroid function slows the response of insulin to elevated blood sugar, so the glucose is slow to enter the cells for energy production. This can actually lead to individuals testing with normal glucose levels, yet still challenged with symptoms of too low of blood sugar. This would be a good start to you regulating your blood sugar and definitely play a role in the entire blood sugar, adrenal and thyroid challenges. If you have yet to register for our complimentary webinar "Thyroid Treatment...Ridiculous!" on Tuesday August 7th, register now. If you have any comments or questions in regard to this newsletter, leave this below and we will address this personally. what are your recomendations for adrenal fatigue? There seems to me ni way out, i am older and have a husband to look after. loosing hope! All hope is not lost. I see this with regularity in my office with my clients and I consistently see improvement. I recommend assessing your adrenal function with an adrenal kit which you can find at the Depke Wellness Store under test kits. I am currently a client of Glen Depke dealing with this same issue. I have been following his treatment protocol for a couple of weeks now and am already seeing some improvement. I wholeheartedly encourage you not to give up hope! I had a thyroidectomy 2004, take 75/88 mcg synthroid, should I be concerned with my adrenal gland and blood sugar level? Doctors have never tested this. Thank you for sharing April. It is always helpful when others hear this from someone working through this personally. With the history of a thyroidectomy, adrenal challenges are likely. I would recommend assessing this with saliva testing to recognize cortisol shifts through the day. If you cannot get this testing, it is available on the Depke Wellness Store at wwww.DepkeWellness.com. The majority of thyroid patients in the U.S. are undiagnosed. At the same time, more than half of all Americans are overweight. Some people need to make alternative thyroid remedies the connection between the two issues. When a person is having problems losing a few pounds or can not seem to gain any they might want to consider other causes besides their diet and exercise regimen. What the Heck is in My Water? Fruit is Not Good for Me?